Smoke rises as first-stage boosters separate from a Soyuz rocket with a Soyuz MS-10 spacecraft carrying a NASA astronaut and a Russian cosmonaut. The mission was aborted shortly after launch, and the pair returned to Earth safely in an emergency landing. 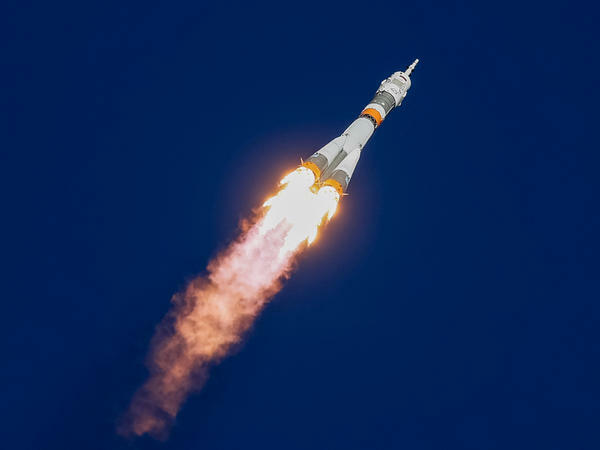 The Soyuz MS-10 spacecraft carrying astronaut Nick Hague of the U.S. and cosmonaut Alexey Ovchinin of Russia blasted off from the launch pad at the Baikonur Cosmodrome, Kazakhstan, on Thursday. The future of the International Space Station is uncertain now, however, because this Russian rocket was the only way to get people to the station — and now it's under investigation. NASA has been depending on Russia's spacecraft and launch hardware ever since the retirement of its space shuttles in 2011. The agency does have contracts with commercial companies like Boeing and SpaceX that are developing new vehicles to take astronauts up, but the first flights of those aren't scheduled until next year. A NASA TV commentator at Mission Control Center in Houston describes a ballistic descent or landing, such as the one on Thursday, as coming in "at a sharper angle to land than we normally land at. And that means that the crew inside experiences higher G-force loads as they go through the landing." "That is a landing mode we've seen before," says the commentator. "I'm grateful that everyone is safe. A thorough investigation into the cause of the incident will be conducted," says NASA Administrator Jim Bridenstine, who was in Kazakhstan for the rocket launch. "A live broadcast of the launch showed the Russian-American crew experienced a sensation of weightlessness and spinning at booster separation, signaling a serious problem had occurred," Matthew Bodner told NPR's Newscast unit from Moscow. "Russia's space program, deep in crisis, has experienced a series of high-profile launch failures over the past decade. 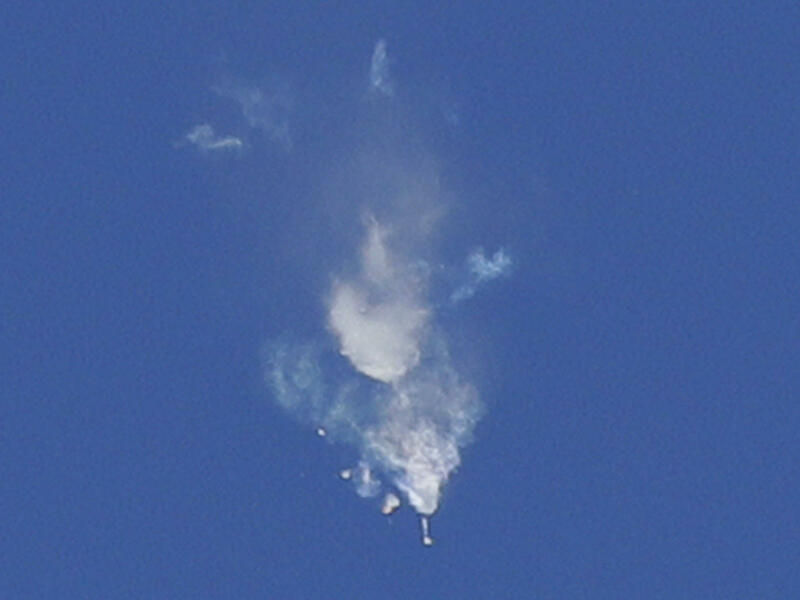 But never in the 20-year history of the ISS program has a manned Soyuz rocket experienced a problem on launch." Hague is a colonel in the Air Force. NASA says it selected him as an astronaut in 2013; he completed training in 2015 and had been scheduled to perform at least two spacewalks as part of his mission on the space station. The two had been slated to join three crewmates on the ISS as part of Expedition 57. The trip to the station was to take them about six hours. Instead, they were picked up by helicopters and then flown by a plane back to Baikonur. Kenny Todd, operations integration manager at NASA for the International Space Station, says the three current residents of the orbiting outpost are fine and have plenty of supplies. They were scheduled to remain up there until mid-December. "That will give our Russian colleagues certainly the better part of two or three months to try to diagnose this problem and understand what they need to do to correct that," Todd told reporters during a hastily arranged press briefing. The existing station crew is supposed to get its ride back home in a Soyuz capsule that is docked to the station. That vehicle has a limited life span and expires in early January. If the Russian rocket isn't flying by then, the station may have to do without a crew for a while. That would be a huge change for an outpost that has been continuously occupied for about 18 years, but it's something that NASA and its international partners have long been prepared to do, if necessary. It's unclear exactly how long the station could keep going without anyone on board, but "I feel very confident that that we could fly for a significant amount of time," says Todd. He also notes that critical systems are designed to operate automatically or with the help of controllers on the ground. He says such key systems have built-in redundancies and could survive failures even if there is no crew available to do repairs. But there does need to be a crew on board for the first test flights of new commercial crew vehicles that NASA is supporting. "The space station is a $100 billion international asset for the world," says Todd. "Having a crew on board, being able to monitor these vehicles as they approach, it's certainly a very important thing."